The reason law firms don’t usually collaborate, says attorney Jade Brown Russell, is because they don’t have to. Russell, principal of The JBR Firm — specializing in legal and lobbying services, diversity consultation and strategic planning — wants to shift the paradigm. For her, collaboration lines up with the same principles of diversity. In her experience, bringing small firms or complementary expertise together on a client project creates thought diversity. Not to mention bonus benefits in better quality, lower overhead and increased sustainability. Russell’s entire career has been working toward this collaborative mindset, but she says serving as interim director of the French Market Corporation really honed her technique. Managing an $11 million budget; more than 60 employees; and the market’s many properties, parks and residences — all while communicating externally with the mayor, the city and the community — Russell was collaborating non-stop in varied capacities. “It really shed a light on me to connect with other people and tap in to their strengths to connect with your own for the ultimate benefit of what you’re trying to accomplish,” she says. Russell then returned home and served as Regional General Counsel for Caesars Entertainment and Harrah’s New Orleans, practiced law at Adams and Reese, LLP and co-founded Transcendent Legal, the first legal-tech startup in the Gulf Coast, providing clients efficient and transparent IT-driven project management. Her community involvement is a career and story unto itself. A highlight of her current service includes: Co-Chair of the City of New Orleans’ 2018 Tricentennial Commission’s Community Engagement Committee, Vice Chair of Bricolage Academy, Vice Chairman (and founding member) of the Urban League of Greater New Orleans and a board member of the Arts Council of New Orleans and Ashè Cultural Arts Center. Still, she recognizes how full her plate is and recently has been forced to take stock. A few weeks ago, Russell was on her way out to a legislative session in Baton Rouge when she slipped on her front walkway in unsupportive shoes and broke her ankle, requiring reconstructive surgery. “A little squad running in and out”: Since her unfortunate ankle incident, Russell’s extended family has taken amazing care of her, not to mention her daughter, 11, and son, 5. It’s the whole reason she left Chicago and moved back home. Her family and friends (affectionately referred to as her “squad”) have also made it easy for her to be more involved in civic causes too. “If I have a meeting, I have a whole list of people I can run down to help me get my kids to their after-school commitments,” she says. The apple doesn’t fall far: Russell credits her mother for inspiring her work ethic and her father (current president of the Orleans Parish School Board) for inspiring her community engagement: “I’m the perfect petri dish of my parents,” she says. The trophy case: Her civic and career success have led to a CityBusiness Leadership in Law award, two CityBusiness Woman of the Year awards and two Rising Star Awards from the Urban League and a recipient of the Mayor’s Community Excellence Award. Diversity’s importance: Russell’s clients run the gamut from start-ups to the well-established Harrah’s New Orleans Casino and Hotel. She provides counsel to entrepreneurs, non-profits, a national asset management company, a housing authority and community land trust. 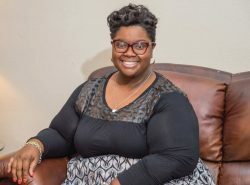 With her diversity and inclusion clients, like the Louisiana Stadium and Exposition District, she collaborates on process improvement to increase a more diverse participation throughout organizational operations.